In connection with the fifth anniversary of the illegal annexation of Crimea by Russia, High Representative of the European Union for Foreign Affairs and Security Policy Federica Mogherini, on behalf of the European Union, made a statement in which she confirmed her commitment to the sovereignty and territorial integrity of Ukraine, as well as a policy of non-recognition of illegal annexation. The corresponding statement was published in Brussels on Sunday. "Five years on from the illegal annexation of the Autonomous Republic of Crimea and the city of Sevastopol by the Russian Federation, the European Union remains steadfast in its commitment to Ukraine's sovereignty and territorial integrity. 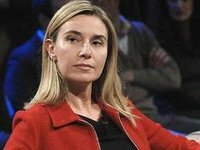 The European Union reiterates that it does not recognize and continues to condemn this violation of international law," Mogherini said. She said that the given fact "remains a direct challenge to international security, with grave implications for the international legal order that protects the territorial integrity, unity and sovereignty of all States." "The European Union remains committed to fully implementing its non-recognition policy, including through restrictive measures. The European Union calls again on UN Member States to consider similar non-recognition measures in line with the UN General Assembly Resolution 68/262," she added. In addition, Mogherini noted that violations of international law by Russia had led to a dangerous increase in tension in the Kerch Strait and the Sea of Azov. "The unjustified use of force by Russia against Ukraine on 25 November 2018 is a reminder of the negative effects of the illegal annexation of the Crimean peninsula on regional stability. The EU reiterates its call on Russia to release the illegally captured Ukrainian crewmembers, vessels and equipment unconditionally and without further delay," the High Representative of the European Union said. He pointed out that pending their release, Russia should respect their rights to legal representation and access by consular authorities, and to provide the injured crewmen with appropriate medical treatment. Mogherini also noted that the EU condemns the construction of the Kerch Bridge without the consent of Ukraine, which is another violation of the sovereignty and territorial integrity of Ukraine. The EU expects Russia to ensure unhindered and free passage of all ships through the Kerch Strait to and from the Azov Sea, in accordance with international law. The illegal restrictions to such passage have negative economic consequences for Ukraine's ports in the Azov Sea and the whole region," she stressed. In addition, the EU High Representative referred to the holding of elections by Russia on the territory of Crimea. "The European Union does not and will not recognize the holding of elections by the Russian Federation in the Crimean peninsula," Mogherini said. She added that the increasing militarization of the peninsula continues to impact negatively the security situation in the Black Sea region. Mogherini also noted that since the illegal annexation by the Russian Federation, the human rights situation in the Crimean peninsula had significantly deteriorated. "Residents of the peninsula face systematic restrictions of fundamental freedoms, such as freedom of expression, religion or belief and association and the right to peaceful assembly," she said. She laid emphasis on the fact that in accordance with UN General Assembly resolution 73/263 of 22 December 2018, it is crucial that the regional and international human rights monitoring mechanisms as well as the non-governmental human rights organizations have unimpeded access to Crimea and Sevastopol. She also paid attention to the rights of the Crimean Tatars that have been gravely violated through the shutting down of Crimean Tatar media outlets, the banning of the activities of the Mejlis, their self-governing body, and the persecution of its leaders and members of their community. "The EU expects Russia to reverse these decisions and to end the pressure on the Crimean Tatar community. Crimean Tatars, Ukrainians and all ethnic and religious communities in the peninsula must be ensured the possibility to maintain and develop their culture, cultural heritage traditions, education and identity," she noted. "Russia must also take measures to improve the environmental situation, which has considerably worsened since the illegal annexation," Mogherini said. "The EU reiterates its call for the immediate release of Oleh Sentsov, Edem Bekirov, Oleksandr Kolchenko, Mykola Semena, Volodymyr Balukh, Emir-Usein Kuku and all those who have been detained in the Crimean peninsula and sentenced in breach of international law. Journalists, human rights defenders and defence lawyers should be able to work independently and without undue interference and intimidation. The EU calls for full compliance with international human rights standards in the peninsula," her statement published on the EU website reads. She insists that all pending cases of human rights violations and abuses, such as enforced disappearances, torture and killings, violence, politically motivated prosecutions, discrimination and harassment be thoroughly investigated. "Full, free and unrestricted access for international human rights actors to the whole territory of Ukraine, including Crimea and Sevastopol, continues to be paramount. The EU recalls UNGA Resolution 73/263 of 22 December 2018, and calls for its full implementation, including the Russian Federation's obligations under applicable international humanitarian law," Mogherini added.